James Cohan Gallery is pleased to announce the first New York solo gallery exhibition by Dutch artist, Folkert de Jong, who reinvents monuments and classical figurative sculpture by combining fictional and factual histories into life-sized sculptural tableaux. His sculptures are made from unconventional, industrial insulation materials – Styrofoam and polyurethane foam – whose color palette of baby blue and pink and their inherent toxicity are what he refers to as, "one big moral contradiction." Best known for work that employs the vehicle of the 'grotesque,' De Jong reflects upon the paradox of contemporary life where advances in global policy, economics, science and art exist alongside the continuous forces of war, misfortune and catastrophe. While his characters often embody the darkest side of the historical and contemporary geo-political terrain, they nevertheless maintain an underlying humor and humanism. As Prof. Dr. Kitty Zijlmans describes in a recent catalogue essay, "It attracts and repels you; it is horrifying and humorous, melodramatic and macabre, caricatural and confrontational. And all at once." 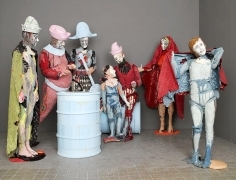 In this new body of work, which consists of four major installations with the overall title Les Saltimbanques, De Jong departs from the 'pseudo monument', full of exaggerated violence and delightful horror, to a quieter psychological tension that the artist has found in the subject of the Harlequin. Inspired by characters from Picasso's Rose Period works, De Jong's Harlequin is a lonely adventurer whose rootless existence can be read as a metaphor for that of the contemporary artist. This expressionistic interpretation of the Harlequin nods to Picasso's use of this image as an alter ego—an outsider who plays witness to human folly. 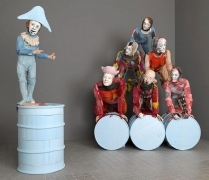 In the front gallery, De Jong introduces the family of characters in a group portrait that recalls Picasso's well known painting, Family of Saltimbanques (1905). Continuing into the main gallery, the works Human Pyramid and Human Pyramid; Violin Player depict figures found in the pyramidal and vertical formations of acrobats engaged in circus play. The Circle of Trust, installed in the back gallery, shows the family behind-the-scenes, huddled around a fire in an oil barrel. 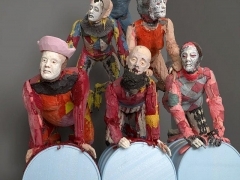 The pathos inspired by De Jong's depiction of these itinerant performers, whose lives are on the periphery of mainstream society, has a cinematic quality that recalls such science fiction classics as La Jetée (1962), Mad Max (1979), and Apocalypse Now (1979). The 'anti-material' that De Jong chooses as his medium, in addition to the use of props such as the oil barrel, confront the viewer with the inescapable social and political realities of contemporary life. As De Jong states, "With my life-size, figurative sculptural installations I want the public to become aware of the mechanism of sublime emotion, and how much we are being manipulated by mass media with this mechanism in order to influence our critical opinion." Folkert de Jong was born in Egmond aan Zee, the Netherlands in 1972. He attended the Rijksakademie for Visual Arts, Amsterdam and the professional health care school HBO in Alkmaar. He was co-founder of the foundation Space For Artists, Amsterdam. 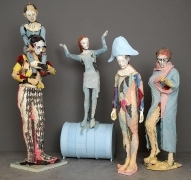 In 2003 De Jong was a finalist for the Prix de Rome for sculpture. Recent solo exhibitions include: Der Falsche Prophet, Peres Projects, Berlin (2007), Gott Mit Uns, Lever House, New York (2007), Medusa's First Move: The Council, Chisenhale Gallery, London (2005); recent and exhibitions group exhibitions include Destroy Athens, Athens Biennial (2007) and Chronic, Museum Dhondt Dhaenens, Deurle, Belgium (2007). Folkert de Jong lives and works in Amsterdam. This exhibition and the accompanying fully-illustrated catalogue have been realized by the generous financial support of the Mondriaan Foundation, Amsterdam and the Consulate General of the Netherlands in New York. The catalogue, published by James Cohan Gallery and Black Cat Publishing, Amsterdam, includes essays by Marc Straus and Gregory Volk. Running conexhibitions to the exhibition is Folkert de Jong's long-term site-specific installation, Mount Maslow, at the Hudson Valley Center for Contemporary Art (HVCCA) in Peekskill, New York, opening October 21st, 2007. For more information, please visit www.hvcca.com or call 914 788 0100. To access articles and reviews, as well as biographical and bibliographical information, please visit the artist's page at www.jamescohan.com. To arrange an interview with the artist or for further information, please contact Jane Cohan at jane@jamescohan.com. or 212 714 9500.